Schlock-Wire: Arrow Video U.K. To Release MILANO CALIBRO 9 As A Blu-Ray Special Edition – Schlockmania! 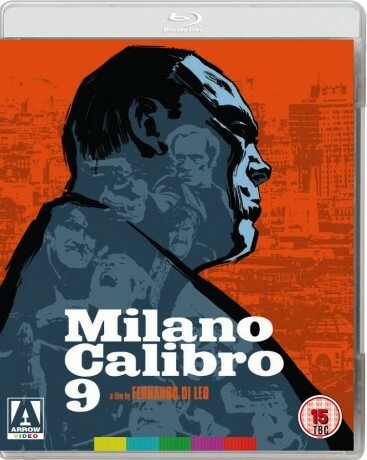 Arrow Video is thrilled to announce the release of the first part of Fernando Di Leo’s Milieu trilogy, Milano Calibro 9, this gritty, ultra-violent masterpiece will debut on Blu-ray from 15th June 2015. Boasting a brand new 2K restoration of the film from the original camera negative, this disc will come loaded with bonus content, including the 2004 making of the film which brings together interviews with various members of the production team. Also included as part of the extra features will be the documentary, Fernando Di Leo: The Genesis of the Genre which looks back at the filmmaker’s career and will include an interview with Di Leo himself. Other features include Scerbanenco Noir, a look into the work and history of Giorgio Scerbaneco, author of the original Milano Calibro 9 novel and an appreciation of Milano Calibro 9 by Matthew Holness, writer and star of cult series Garth Marenghi’s Darkplace. In addition, the Blu-ray comes with both the US and Italian trailers, a reversible sleeve featuring original and newly commissioned artwork by Reinhard Kleist and a fully-illustrated collector’s booklet featuring new writing by Roberto Curti, author of Italian Crime Filmography, 1968-1980, illustrated with original archive stills and posters. The first part in director Fernando Di Leo’s ‘Milieu Trilogy’, Milano Calibro 9 is a gritty, ultra-violent masterpiece and an essential entry in the canon of the poliziottesco subgenre (Italian crime thriller). Released after a three-year term in prison for a bungled robbery, Ugo Piazza plans to lead the straight life for a while. But no sooner is he back on the street than he’s picked up by a bunch of hoodlums under the employ of his former boss, ‘the Americano’ – among them, the psychopathic Rocco – who are convinced that Ugo has stolen $300,000 from them. The gang forces Ugo to resume working for them in the hope that he’ll eventually lead them to their missing loot. Eschewing the sleazier, more exploitative approach of some of its poliziotteschi peers, Milano Calibro 9 delivers an altogether more thoughtful approach to its subject matter – although Di Leo is not averse to show-stopping gun fights and long, lingering shots of the lovely Barbara Bouchet (Don’t Torture a Duckling, The Black Belly of the Tarantula).